Greg Allen burst on the national scene as a freshman football player gaining over 500 rushing yards in two games alone. 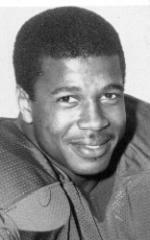 He would go on to break the NCAA record with 400 all-purpose yards in one game, including 322 rushing yards against Western Carolina in 1981. He set Florida State records for career rushing yards with 3,769 from 1981-84 and also set school marks for career carries (624) and touchdowns (44). On the track, Allen long-jumped 24’11¼”, ran a 10.82 100 meters, and even more impressively, was clocked at 4.28 in the 40-yard dash. He stands as one of the truly great all-around athletes in Florida State history and perhaps its most prolific football runner until Warrick Dunn came along.